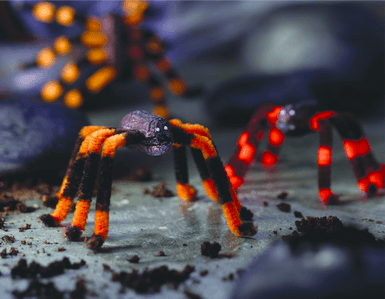 (NC)—Making these creepy critters together is a great family activity – and they’re sure to scare off all the ghosts and goblins on Halloween. 1. Carefully open peanut, ensuring each half shell is intact. 2. With black marker, colour the outer surface of each half shell. Let dry. 3. Fold one pipe cleaner in half. Using sharp scissors, cut pipe cleaner into two equal pieces at fold. 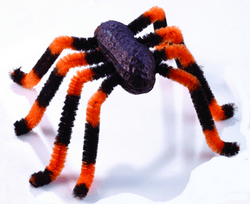 Repeat step with second pipe cleaner to make a total of four pieces, each approximately 6″ (15 cm) in length. 4. 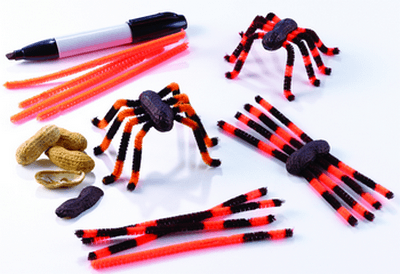 Colour each piece of pipe cleaner with black stripes using marker. Let dry. 5. Generously apply glue along edge and inside of one half shell. Place each piece of pipe cleaner side by side, centred and perpendicular to the shell. Generously apply glue along the edge of the second half shell and affix on top of the pipe cleaners, ensuring both half shells are aligned and edges match. Use two pieces of clear tape to secure the front and back of the peanut shell. Remove tape when glue dries. 6. Separate each pipe cleaner piece and carefully bend at angles to make joints. Additional information, as well as recipes can be found at www.peanutbureau.ca.